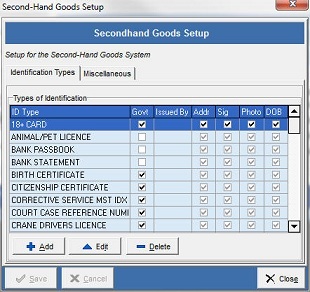 Tower Systems provides secondhand goods management as a feature within our specialist retail software. The feature was initially developed for jewellers, but has been enlarged and enhanced over time to serve more retail channels that deal in secondhand goods. As the retail channels in this space have expanded so has the knowledge available to Tower Systems to better serve the needs of the retailers. A core ethos of Tower Systems is learning from our retail partners and growing together with our customers. While managing and selling used products may seem more complicated than dealing with new stock straight from a regular supplier's warehouse, with the right technology and procedures the process can be easily simplified and improved. Our secondhand goods management facilities are tailored to this end and are detailed and robust. From buying to selling and shop floor management, we track used product accurately, ensuring data integrity. The facilities assist retailers in meeting their regulatory obligations in tracking secondhand goods, something vital in today's business climate. Business owners using our software save time, removing any need for obsolete record keeping - our specialist software maintains all best-practice records. This data integrity is particularly valuable in times of potential dispute. We have been careful to ensure that our secondhand goods facilities meet police reporting and EDI requirements. NSW Police are the most advanced in this area and their standards provide integral guidance. Secondhand goods management is a specialist field relevant to a number of discrete retail markets. Tower Systems is thrilled and proud to continue serving business in this area and as with all of our products we offer installation services and detailed training to ensure you make the most of your investments.